Gov. Jay Inslee ordered Highway 99 tunnel contractors Thursday to suspend drilling the deep-bore tunnel along the Seattle waterfront, until a sinkhole that formed this week is fully investigated. Even though contractors filled the hole, the ground above the tunnel-boring machine Bertha is continuing to sink, according to the Washington State Department of Transportation (WSDOT). The problem is limited to the area immediately around the machine, and has not spread to the nearby Alaskan Way Viaduct, said WSDOT spokeswoman Laura Newborn. But in calling for the work to stop, the governor aired the worry shared by many citizens — that if Seattle Tunnel Partners (STP) continues to dig too much soil as Bertha proceeds north, the viaduct and downtown buildings could be threatened. Chris Dixon, STP project manager, revealed Wednesday that workers poured 250 cubic yards of a concrete-sand mix to fill the hole that developed Tuesday night. The hole was 35 feet long, 20 feet wide and 15 feet deep. 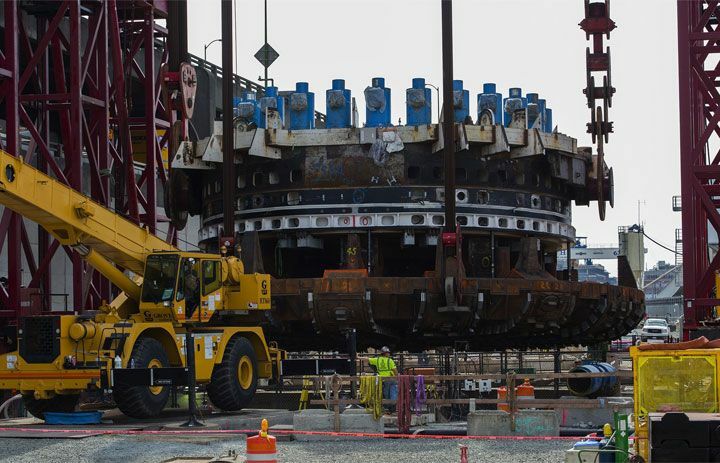 The site is just north of a repair-access vault where Bertha’s 4-million-pound front end was reattached last year after a machine breakdown in December 2013, and subsequent repairs. But the ground over Bertha is continuing to sink, state officials said. “The full extent of ground loss has not been determined and settlement is increasing,” according to the suspension notice from Brian Nielsen, a deputy program administrator for WSDOT. Before the machine digs again, STP needs written permission from WSDOT, the notice says. “The contractor will not resume tunneling until they demonstrate that they can proceed in safety and proceed with their work and have plans in place to prevent this type of incident in the future,” Inslee said at a Thursday news conference, at which he discussed other state troubles, including the mistaken early release of prisoners. The state will expect a detailed “root cause analysis” to satisfy a team of outside experts, said a letter to WSDOT staff by Transportation Secretary Lynn Peterson. Other work, such as the completion of tunnel-maintenance buildings, at the tunnel’s north and south portals, will continue. Dixon has acknowledged his team had not been following the same soil-measuring protocol it had earlier in the project. He said Wednesday that going forward, dirt would be manually measured every 6½ feet, while the tunnel-boring machine stops to assemble a new tunnel ring. Dixon did not reply to messages Thursday requesting a response. The viaduct has been shielded from damage, by buried concrete pilings that contractors installed early in the $2 billion project, for just this kind of situation. Bertha, which just started digging again last month, is two years late on its path from Sodo to South Lake Union, and the four-lane, tolled tunnel being built to replace the viaduct is now estimated to open in April 2018. The sinkhole formed the same day as another mishap, in which a barge tipped and spilled excavated soil into Elliott Bay. Voids can occur above a tunnel machine when too much dirt falls into the rotating cutterhead, and the soil overhead settles. Over-excavation is a risk in tunnel-boring operations worldwide. Dixon on Wednesday said the tunnel team has focused lately on Bertha’s speed, force, efficiency and temperature, and didn’t perform continuous soil checks. The partnership, led by Dragados USA and Tutor-Perini of California, promised in its winning bid for the $1.35 billion contract that soil would be measured by scales and lasers as it moved through the drill on conveyor belts. It’s unclear how long a root-cause analysis would take, but it’s probably longer than the couple days Dixon said he needed to install rubber bumpers around damaged Terminal 46, where the barge incident occurred. 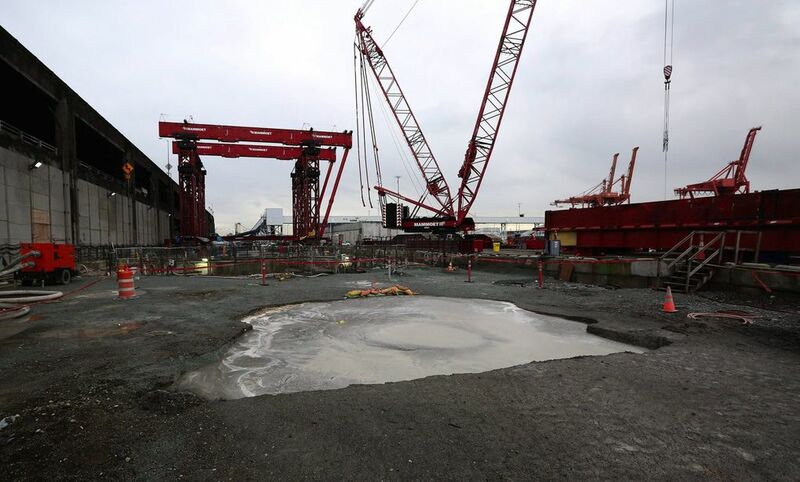 Without Inslee’s order, Dixon planned to restart Bertha as soon as the terminal was ready. A root-cause analysis typically entails interviews of front-line workers, physical analysis of machinery and materials, and sometimes opinions from outside experts such as retired megaproject engineers. Bertha relies on a conveyor-belt system to carry excavated dirt out the rear of the machine and to the waterfront. WSDOT leases a 5-acre loading area at Terminal 46 from the Port of Seattle, where tunnel muck is poured onto STP barges for transport to a quarry near Port Ludlow, Jefferson County. Thom Neff, a Boston-area megaproject consultant who warned of tunneling risks in a 2010 report to then-Mayor Mike McGinn, said the area’s wet dirt is difficult to measure, so the sinkhole doesn’t surprise him. “Managing the tunnel-muck consistency is not easy in normal conditions. It is very complex in Seattle because at no time is the [machine] cutting a single type of soil,” he said. Thursday’s order raises the question of whether contractors might try to bill the state for causing further delay. State officials have often worried about liability if they tell Dixon how to proceed with tunnel work. Stakes have been raised by the machine’s two-year delay and more than $220 million in extra payments requested by contractors since mid-2013, based on several issues. Peterson did temporarily declare the team in breach of contract in early 2014, for falling behind contract goals for hiring minority-owned small businesses, until that problem was resolved. The world’s largest boring machine is currently stopped just north of Main Street.